There is so much here to respond to that my head is spinning, and I'm not drunk. But I am soooo glad you picked this option, Martha, because you truly have done it justice! =) Just two quick things, then: 1) Your "problems" will totally be a stepping stone for Annika, and 2) I love you too, man! LOL, Connie. Hmm, regular drunk blogging. Well, I do have every Friday afternoon without Annika. Cool to know that your name means, yes, you are so much more. You rock! Next time we do a mamma happy hour lets stay for an extra beer, just 'cause. Yes, the cleansing helps for sure. I think the longer I go without it, I just don't want it anymore. As for mama happy hour, you got it! I haven't been to one in over a year, I think I'm due! I'm ALWAYS up for a mama happy hour. I'm still a lush in my mind's eye, even if I don't get stink assed drunk anymore. Happy award winning, Martha! Okay, Doublle Chocolate Stout is one of my favorite things EVER. You're officially my new internet friend. Advice: Get your hands on a pint of Raspberry Brown. You won't regret it! I mean Double. I'm drinking too. @ Courtney, well, I figured you were a closet lush! LOL JK. Wine for everyone at the next mama happy hour! @ Margaret, you are totally my new friend too. I couldn't get enough of your blog last night. I still have the image of you balancing on something, a radiator, was it? @ Chuck, I love you too man. Happy Birthday. Yay Martha! 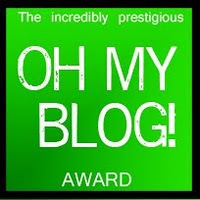 You are one of my favorite bloggers – you are on my favorites bar, as a matter of fact. Congratulations!! I also applaud your choices for awards. Alex and Sonya are two of my favorites as well, and I can't wait to check out Soy Mami y Mas. Elizabeth, I didn't realize you had a blog. Link please? Or, is it private, just for family?